Hi all, I have a series on Singapore about all the places you might want to see do and things to eat. 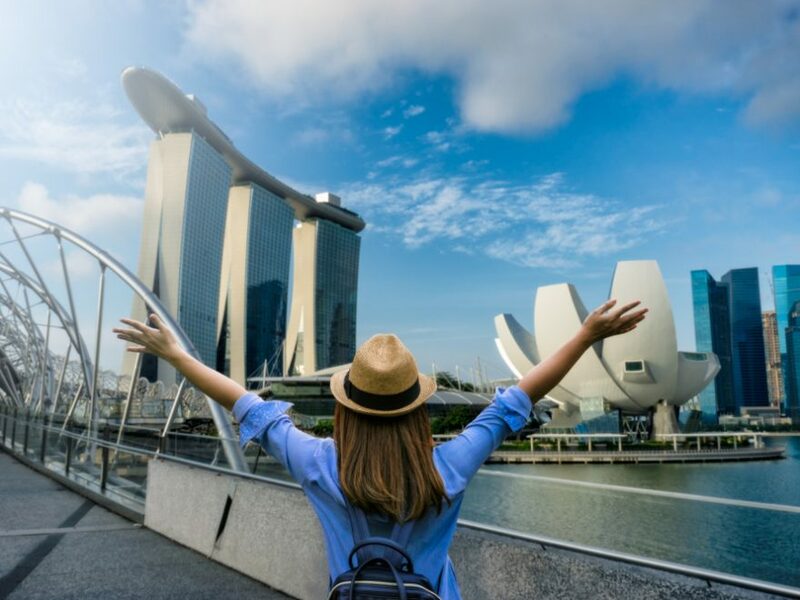 Here in this article I’ll just give you some general basics about visiting Singapore so you understand what you’re getting into and I’ve got these basics divided into six different areas along with tips in each one. If you’re wondering what this is well there are some notes that I wrote to make sure I keep myself on track and I’d tell you all the basics and tips that I want to tell you . The things we’re going to talk about first we’re going to talk about weather then we’re going to talk about the language money safety and laws food and public transportation. The weather Singapore is hot and humid. It’s actually not just hot and humid it’s really hot and humid so dressed appropriately. Singapore is one degree off the equator so it’s hot pretty much all year round. The weather doesn’t change all that much your only reprieve from the heat is going to be on days when it’s partially cloudy. At times, it’s a little bit rainy and actually the rain will be your friend one of the things I’ll tell you and this is kind of a tip related to dressing is don’t just dress cool but dress in clothes that dry quickly. I love cotton t-shirts and this is the best dress sense when you are in Singapore because it gets wet from the rain and my sweat. It never dries and that really stinks literally so I like to wear these shirts from ex-officio there’s a bunch of companies that make these types of shirts they dry really quickly they also have quick drying underwear . Opps… off the topic. Let’s have a little more information than you want to know but there you go the other things I’ll tell you to bring with you make sure you wear sunscreen because it’s sunny and really hot. Do carry little umbrella it’s good to probably get a little travel umbrella like this keep it with you because the downpours can be pretty sudden there’s usually some partial % chance of rain all the time of the year. Every day that you’re here so don’t get caught without it and frankly some people wear those rain jackets like those plastic bag things do you put over yourself oh my god those are awful here because it’s so hot and humid. You’ll end up being just as wet inside from your sweat as if you just got in the rain. Number two let’s talk about the language in Singapore a Singapore has four official languages that include English Mandarin Malay and an Indian language but the official official language is English. Hawker Center is really busy lah! “Lah”emphasis type word so they have a bunch of those words you could look ups English read all about it but you’ll definitely hear it when you get here by the way something. While Singapore is a really modern city a lot of it is still cash based so it’s really important to have cash in Singapore most of the major stores will take credit cards but many stalls at Hawker centers won’t and taxis kind of hit or miss with credit cards and if taxis do take credit cards they will often charge you a 10% surcharge for using your credit card. So bring money and my tip related to bringing money is avoid all of the exchange counters don’t go to that exchange counter in the airport or the shady exchange counters on Orchard Road get money from an ATM. Bring your ATM card the ATMs here in Singapore will give you the best exchange rate much better than the change counters. This might be a good idea to let your bank know that you’re traveling so that they don’t deny your claims when you get here all right so that’s money. Next tip we’re going to talk about safety and laws kind of together one of the things is that Singapore is a country of rules and the country of laws and you should follow them they have a lot of interesting laws. Do you know chewing gum is illegal. Don’t even bring it into the country with you durians a fruit is illegal to take on the MRT – our mass rapid transport rail. If you take a durian on the subway so make sure you follow their rules don’t jaywalk don’t do a lot of things like that you will get a big hefty ticket. You don’t really have to worry about your personal safety walking around. One interesting this here is you’ll see in Hawker centers people will often put their purse down to save their table and guess what their first day is there for them to come back I might not advise you to do that because actually their biggest crimes or petty crimes which are things like pickpocket. Still worthwhile to be aware okay next one food food Singapore is a foodie destination and you really don’t have to worry about getting sick here in Singapore because the food here is awesome clean. If you eat at the hawker centres or food courts cheap don’t think you have to go to high-end restaurants to get the best food and actually my tip is to tell you that really the best food is in the Hawker centers. My second tip is if you don’t like heat then go to food courts you’ll pay a little more and the food might not be quite as good but still pretty good and you’ll be in air-conditioned comfort. Singapore is a fast clean efficient relatively cheap they have an MRT their metro rapid transit or mass rapid transit that’s their equivalent of a subway. It goes almost anywhere you would want to go as a tourist they recently connected Changi Airport to the city you do have to transfer once if you’re going to the city center. Riding the MRT is make sure you buy a ez link card you can buy tickets per ride but it’s much cheaper it’s almost half the price if you use the EZ link card for tickets it’s about a 10 to 12 Singaporean dollar deposit. You just load it up and tap it in when you go on and go off. The rides are pretty cheap as an average ride cost 82 cents. However the train close at midnight so now you’re going to say well what do I do between the hours of and midnight. Well then you’re going to take a taxi taxis are also relatively easy to come by and relatively inexpensive unless you are riding them at night they have a lot of hidden surcharges on taxis. If you’re riding at peak times you’re riding at night and at night they charge a $additional charge to ride the taxi there’s also buses but I think you’ll find that a combination of taxis and MRT will get you almost anywhere you need to go. Have fun travelling around in Singapore!